The system uses 2 laser beams that literally mark a visible “X” on the point. The lasers are controlled with an intuitive Android tablet with standard gestures and controls. The user simply selects the desired point and the lasers automatically find that point.It is fast, efficient and does not require any specific training. The QML800 system is composed of 2 lasers controlled by an Android tablet. The 2 lasers communicate in wireless mode with the tablet. 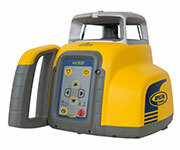 • Automatic or Manual Grade Matching – the laser will automatically calculate and display the grade when trying to match pre-existing slopes on the jobsite where the actual grade value might not be known. • Automatic Axis Alignment – When working with grade it is important to get an accurate alignment to your grade hub to eliminate grade errors. The universal laser will automatically align to your grade hub providing an accurate set-up. • Optional IR remote – allows the laser to be sloped whilst still remaining self-leveled in the cross axis. 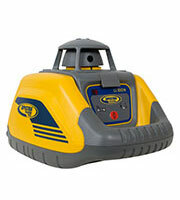 This is ideal for grade matching when working on driveways or patios. • 5 year Warranty – LL300N, LL400 and LL500 all come with 5 year warranty. • Shockproof – where you see the shockproof symbol it means the product can be dropped 1m (3 ft) onto concrete or survive a 1.5m (5 ft) pushover on a tripod. 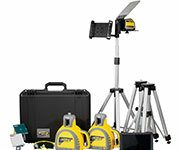 This range of products work with an Infra-red remote control (RC601) to provide full control whether you are on the ground, walking on stilts or on an access platform. 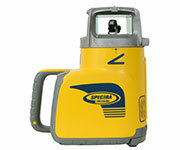 The beam can rotate or scan over a set area and be moved from one position to another using the remote control. All horizontal vertical lasers within the Spectra Precision range are durable and will work in the rain if you choose to use them outside. As with all Spectra Precision products the Quick Measures are designed to withstand tough jobsite conditions and are able to survive drops up to 1.5 m (5 ft) onto concrete. Simply pick it up and press the measure button. You will be glad you added a Quick Measure to your tool box.